Hundreds of thousands of visitors come to our watershed lands each year. Some of the most popular trails on Mt. Tamalpais are those with sweeping vistas, rugged landscapes and beautiful waterfalls. One trail, Little Carson Falls, has the winning combination of all three elements, and as a result, is one of the most frequented trails on the watershed. However, Little Carson Falls is not just a popular gathering place for people. It also holds the trifecta of cold water, slow velocity flow and abundance of cobble substrate, which makes it ideal habitat for the foothill yellow-legged frog (FYLF). The resulting overlap of heavy foot traffic and delicate breeding habitat at Little Carson Falls could spell trouble for a species that is already in decline. The FYLF is listed as both a federal and state Species of Special Concern. It has disappeared from more than 45 percent of its historic range in Oregon and California due to habitat loss and degradation, disease, and the introduction of exotic predators. In the Mt. 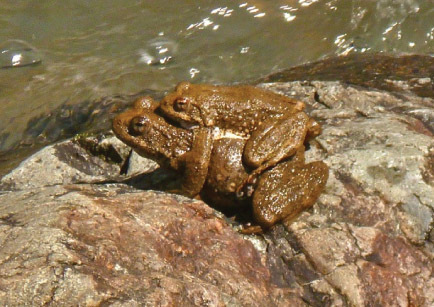 Tamalpais Watershed, the breeding habitat of the foothill yellow-legged frog has been reduced from four streams to two due to heavy recreational impacts and exotic predators. For the past eight years the Marin Municipal Water District has coordinated a Frog Docent Program that has trained volunteers to monitor conditions and be a voice for the FYLF out at the falls. Volunteer docents are asked to commit to three 4-hour shifts between mid-March and early June, when eggs and tadpoles are at their most vulnerable. This year’s docents put in over 90 hours and made contact with over 400 hikers during some of the busiest weekends in spring and early summer. These docents successfully got dogs on leashes and people away from the water by showing visitors that life exists in the falls and informing them about this special, at-risk species. Thank you Ruthann, Peter B., Rachel, Jim, Merna, Katherine, Lorri, Peter D., Mary, Colette, Emily, Anne, Bruce and Mathew. Your enthusiasm and interest in these frogs was amazing and the district was so lucky to have volunteers like you. For more information, see the Frog Docent Season Summary 2012 by AmeriCorps Intern Michael Horwitz.